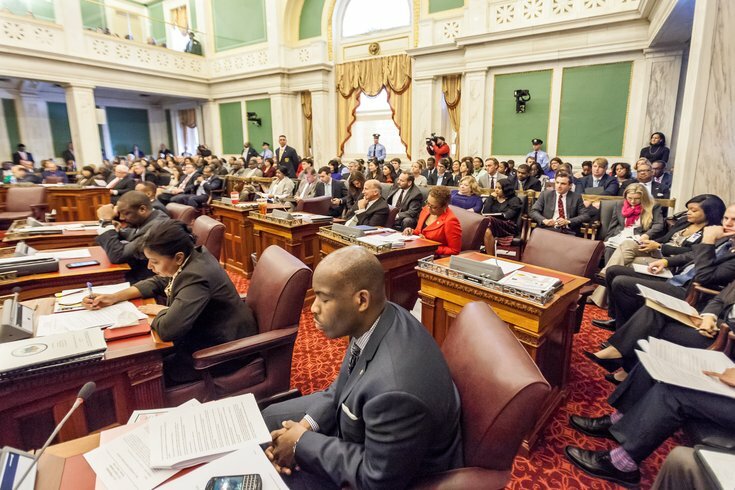 Mayor Jim Kenney delivered his 2017 budget before a packed Philadelphia City Council Chambers on Thursday, March 3, 2016 at City Hall. It’s the linchpin of his desire to fund universal pre-K, community schools, community infrastructure and pensions. It’s such a source of consternation amongst soda bottlers and workers that people were on-hand offering post-speech reaction in Council Chambers. I’d already weighed in on that proposal, though, and details of the vast majority of Kenney’s 35-minute address had already been publicly aired. So, it was easy to set those matters of utmost importance aside in lieu of another topic. What caught my eyes and ears was something Kenney mentioned briefly, and it’s something that won’t draw all that much Council budget-process attention. “Working with key stakeholders, our new Office of Complete Streets and the Managing Director’s Office will identify changes we can make – whether it be better lining or signage or a change in traffic flow – to protect the child walking to school and the cyclist just trying to get to work. “The recent explosion of development has significantly increased sidewalk and street closures. This budget would allow us to ensure safe travel around these closures, and to better enforce penalties against those that are illegal – raising revenue for the city and preventing these dangerous encroachments in the first place. As someone who ended up on the wrong side of a car vs. pedestrian collision, and who is forced to walk in the street because of absurd construction site barriers, these words were as important to me as the request for police body-worn cameras are to other Philadelphians. In saying them, Kenney took steps toward fulfilling both pre- and post-election promises. While the dollar figures involved were scarce in Kenney’s address, his deputy communications director Mike Dunn brought me up to speed about “Right of Way” fees that cover street-closure permits. Bass was name-checked in Kenney’s address thanks to a bill she championed into Council-passage last December that imposes a $5 fee on all motor-vehicle registrations with the expressed intention of bolstering roadway safety initiatives. Bass estimated the initial financial impact of that passage at $3.4 million this year which could be used for safety measures like speed bumps, rumble strips and the like. In other words, smaller investments that can have a large impact in the lives of many. Compared to the overall city budget, these figures are minuscule. The impact they'll have, however, far outweighs mere calculations. People who whine about the intrusiveness of Vision Zero efforts are the type of folks who love to hear themselves complain. If one person is spared an ambulance ride because of the $5 registration fee, it's worth it. All of which is to say that sure, most attention will be paid to the soda tax battle, but should these roadway initiatives pass Council muster (and they all but certainly will), what I’ll remember most about Kenney’s first budget address is how it made our streets and sidewalks safer.